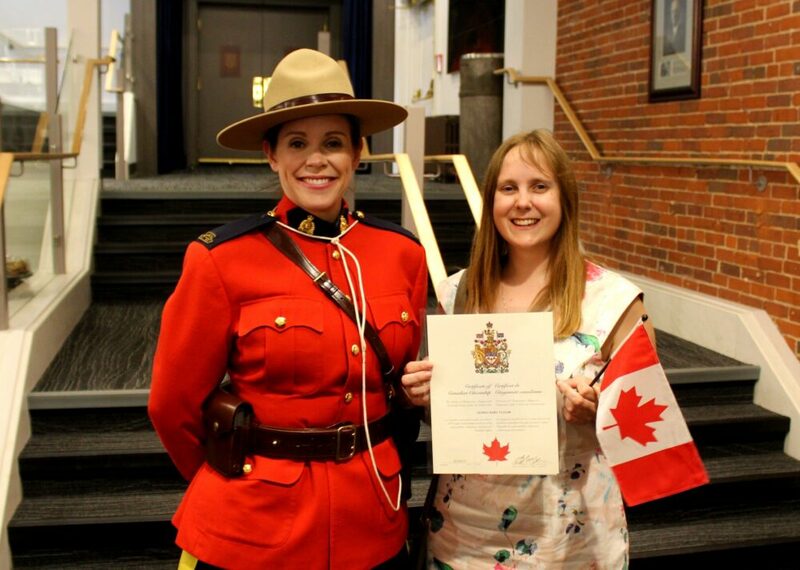 On 15th May 2018, I became a Canadian citizen! I am so proud and happy to be a citizen of this amazing country. 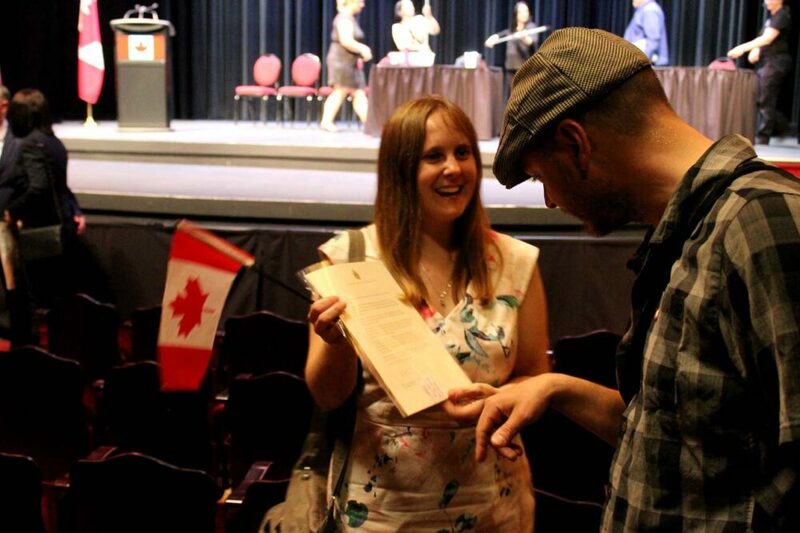 Becoming a citizen ends my seven-year journey with Canadian immigration. Never did I imagine when I arrived in 2011 for ‘just one’ ski season that I would ever become a Canadian citizen! About to apply for Canadian citizenship yourself or simply wondering what the process was? 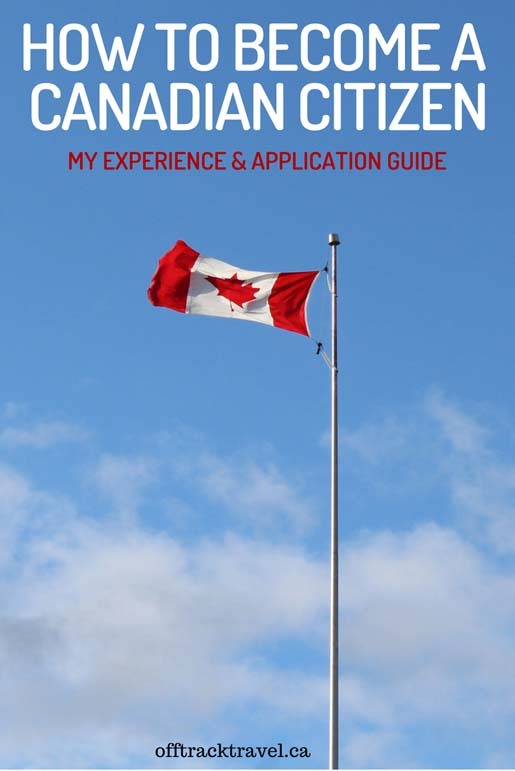 Keep reading for the full details of my Canadian citizenship application experience. I chose to apply to become a Canadian citizen as soon as possible. In contrast, some Canadian Permanent Residents choose to wait many years or do not even apply to become a citizen at all. Permanent Residents of Canada have to carry a PR Card, renewable every five years. The application requires all addresses, employment, travel history and absences from Canada to be listed. Sounds like a headache to me! Not too long after I became a Permanent Resident, my PR Card was stolen in Italy. It took almost a year to receive a replacement. Unusually, the application also required an interview in Vancouver, a 900km round trip. While waiting for my replacement, I had difficulties entering Canada. While travelling back to Canada from Singapore last year, I was unable to check in for my flight due to issues with the new eTA system. Permanent Residents are usually exempt from having an eTA to fly to Canada. Long story short, I made it home but don’t want to have that experience again! Permanent Residents have a residency obligation to live in Canada for two years of every five. I found this obligation restricting. Visiting the USA as a Canadian citizen is easier than a British citizen – free entry, no secondary inspection required and a longer time allowance. Similar rules were in place when I became a Permanent Resident in 2014. This would have allowed me to apply as early as 2016. Unfortunately, this was not the case. Residency requirements were increased in 2015 to four years of the last six. The half-day work permit contribution was also removed. This extended my wait time to 2018. Enter Trudeau’s government in 2016, who decided to reverse the 2015 changes….but it took them until late 2017 to do so. My advice? If you want to become a Canadian citizen, apply as soon as you are eligible. Just in case the rules change. Once eligible, it is a three-part process to become a Canadian citizen. A paper application is the first step. The second is the citizenship test/interview and the third is the Canadian citizenship oath ceremony. Applying for Canadian citizenship is reasonably straightforward. The most difficult part for me was listing all of my recent addresses, workplaces and travel history. Extra documentation is required in some circumstances. Carefully read through the most recent application guide several times before even starting your application. At the time I applied, IRCC quoted a processing time of around twelve months. 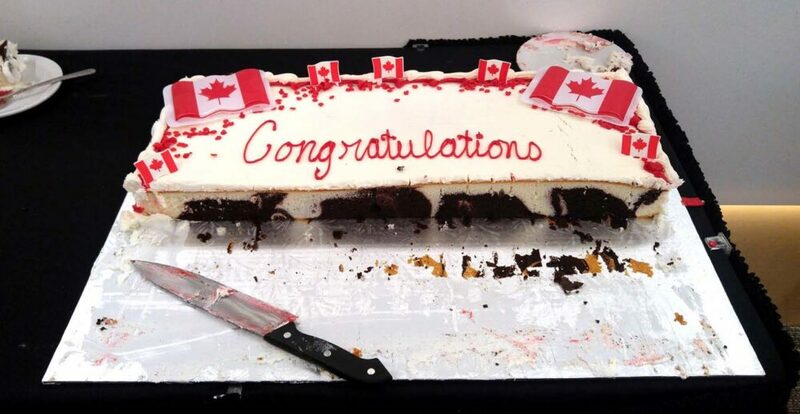 I became a Canadian citizen after exactly seven months, four days after sending my application. Passport stamps and flight confirmations are helpful to use for verifying the dates of travel outside of Canada. Visa-waiver travellers to the US can check their travel history on the I94 website. Be sure to write your Physical Presence Calculator login down. It is very difficult to reset this account if you forget your password and memorable answers. Double check before sending that you have the most recent application form and checklist. Photocopy your entire application, just in case the application goes missing. Let IRCC know ASAP if you move but don’t rely on them reacting. I was booked into a citizenship test in British Columbia on 31st January 2018 after already advising IRCC that I had moved to New Brunswick on 3rd December 2017. Check your email often, including the spam folder! I had three weeks notice for my citizenship test and four weeks for my oath ceremony. Every applicant aged between 18 and 54 has to take the Canadian citizenship test. For most people, it is a written test. Those who fail will have to wait for another test date. After a second fail, there is a mandatory interview with a citizenship officer. The specific date, time and location of the test is emailed (or mailed) to you. Applicants do not get to pick. Why was the Peace Tower in Ottawa built? What was the significance of the Constitutional Act of 1791? Who was Sir William Logan? 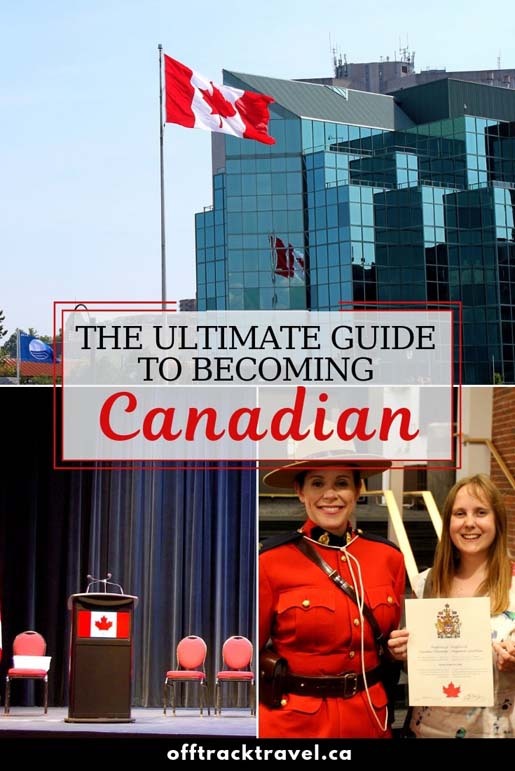 The best way to study for the citizenship test is to read the ‘Discover Canada’ guide provided by IRCC. It is a bit tedious to study, however, all of the questions in the test relate to information provided in this document. There are also some unofficial Canadian citizenship practice tests online but I was a little wary to use these as I found a number of incorrect questions and answers. The Canadian citizenship test has twenty questions with multiple choice answers. The test lasts thirty minutes and applicants have to get at least fifteen questions (75%) correct to pass. I took my test with six other applicants in Fredericton (New Brunswick), about five months after submitting my Canadian citizenship application. After we had all arrived, we were led into a small room with individual desks. The question papers were already facing down on the desks. Answer sheets and pencils were quickly handed out and the test started. We were able to leave the exam room as soon as we finished. Most people in my test left within twenty minutes. I was advised of my exam result shortly after returning to the waiting room – 100%, 20/20! The actual Canadian citizenship exam isn’t the only feature of the test appointment. There is also an informal interview with a citizenship officer to check your documentation and whether you can hold a basic conversation in English or French. This interview is usually held after completing the test. My interview felt fairly casual. The immigration officer checked my ID and then compared the entry/exit dates in my passports to those listed on my Physical Presence Calculator printout. While doing this, she asked about my experience in Canada so far, what work I had been doing, different places I had lived. My oath ceremony was an ‘enhanced’ ceremony which means it had some additional features. Candidates are encouraged to wear business dress and/or traditional dress. In practice, I saw a real mix of dress (from full suits to jeans/t-shirt combos) but most candidates were dressed reasonably smart. Guests are allowed, however, the maximum number varies on oath ceremony location. If limited, this should be mentioned in the oath ceremony notice. 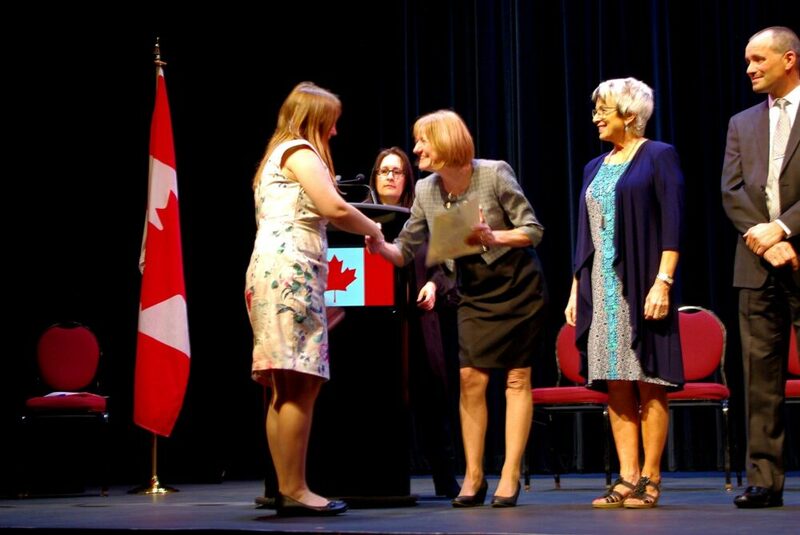 My Canadian citizenship oath ceremony was at the Capitol Theatre in Moncton (New Brunswick), exactly two months and two days after passing the citizenship test. 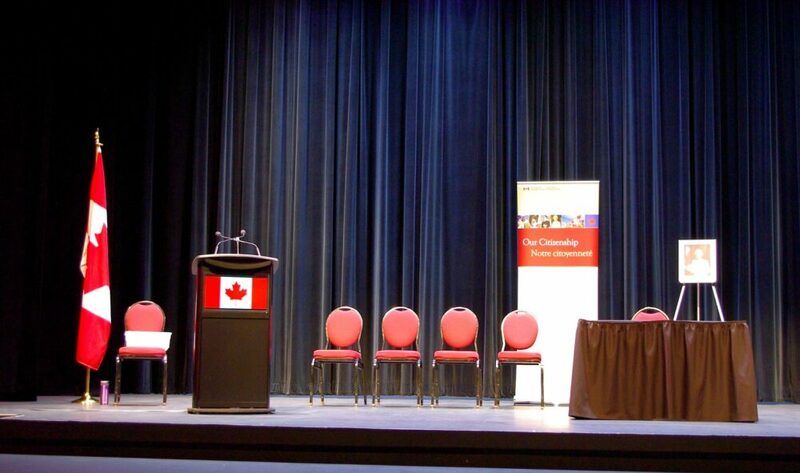 The ’roundtable discussion’ was held in the foyer of the theatre and involved individual table hosts facilitating conversation about Canadian citizenship with candidates and guests. One person from each table then shared some of the discussion with the rest of the room. It was a nice idea but I would have rather moved on to the oath ceremony sooner. The actual oath ceremony went fairly fast. Candidates (47 in total at my ceremony) can choose to repeat the oath in either French or English. 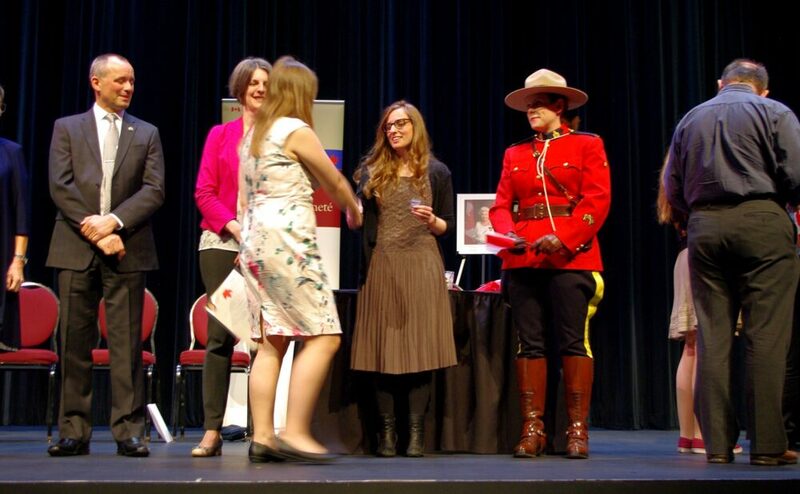 Each new Canadian was then called to the stage individually (or in couples/families) to receive their certificate, shake hands with the guests and then sign the oath/affirmation of citizenship. A few more speeches, a singing of O Canada (a hybrid French/English version), another speech and then it was over. Cake and sandwiches were available in the foyer, plus photo opportunities with a Mountie. 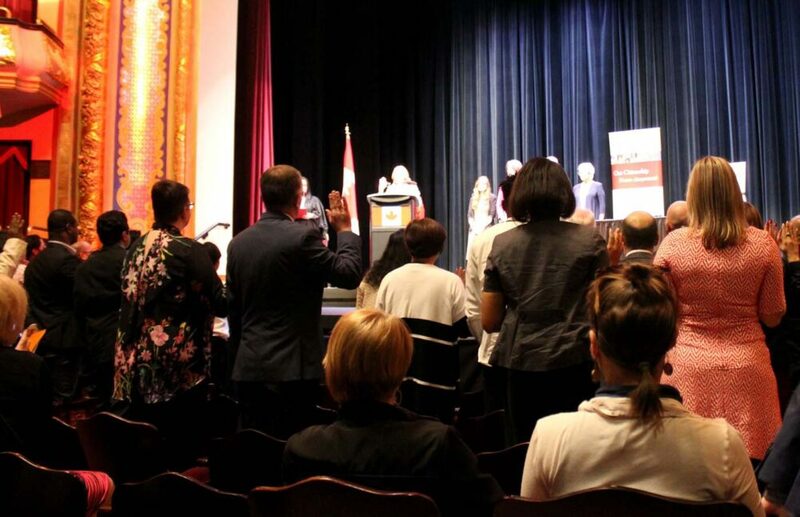 New Canadian citizens need to wait at least two business days after their oath ceremony before applying for a passport. Needless to say, I applied as soon as possible. I applied directly at Service Canada, which meant that I did not have to send my citizenship certiticate away. As an extra bonus, they also paid for postage to the passport office. As well as a passport, I also applied and received a Cultural Access Pass soon after my citizenship ceremony. This pass entitles me to free entry to many free museums and attractions in Canada. I would recommend new citizens to apply as soon as possible as the pass is only valid for a year after your citizenship ceremony date. Have you ever become a citizen of another country? What’s your immigration story? Found this post helpful? PIN or save it for future reference with one of the above images! How did you manage Perm Resident status? Did you get an employer to sponsor your work permit? I am a Mortgage Banker and getting a job in Canada as that is so hard because they say a Canadian could do the job so why hire me…. Hi Denise! As linked in the post, there is information about my Permanent Residency journey here https://offtracktravel.ca/my-journey-to-permanent-residency-via-common-law-sponsorship/ I was sponsored by my Canadian common law partner. Have you looked at Express Entry? Congradulations on becoming a Canuck! Thank you so much for this amazingly detailed post. I will be eligible to apply for citizenship in the spring of 2019 and I have slowly started mapping out everything that I need. I’ve been looking for posts and advice on what to expect and this is the first detailed overview I’ve come across. I used a lawyer for my PR application because it was rushed and I was so overwhelmed, but this time I feel a lot more confident. Did you have anyone go over your citizenship application before submitting or did you do it all on your own? Hi Rasmus! Exciting news on you becoming a eligible for citizenship next year. No, I did not get my citizenship application checked by anyone. It was very straightforward and much, much simpler than the PR application.